We have posted about hurricane awareness and disaster response before. With hurricane Florence on the southeast coast we wanted to round up information for those that may be affected by this storm. 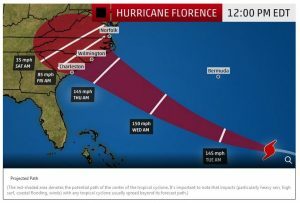 Florence’s projected path as of Monday, September 10, 2018. 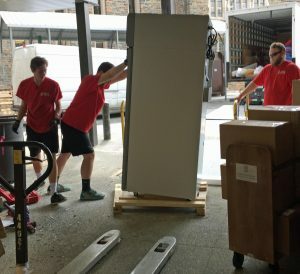 The National Heritage Responders (NHR) – formerly the American Institute for Conservation – Collections Emergency Response Team (AIC-CERT) – responds to the needs of cultural institutions during emergencies and disasters through coordinated efforts with first responders, state agencies, vendors and the public. Volunteers can provide advice and referrals by phone at 202.661.8068. Requests for onsite assistance will be forwarded by the volunteer to the NHR Coordinator and Emergency Programs Coordinator for response. Less urgent questions can also be answered by emailing info@conservation-us.org. 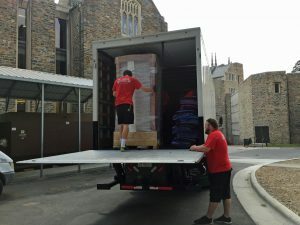 Cultural institutions in FEMA-designated disaster areas of Texas, Louisiana, Florida, and other impacted states and U.S. territories can apply immediately for NEH Chairman’s Emergency Grants of up to $30,000 to preserve documents, books, photographs, art works, historical objects, sculptures, and structures damaged by the hurricane and subsequent flooding. Applications for emergency grants are available here (Word Document). If you are ready to start recovery you can use the Emergency Response and Salvage Wheel ro recover collections. The Wheel is also available in an app on both Android and Apple devices. Many other useful apps are out there to help you find information or organize a response. Local and state organizations such as state archives, museums, university libraries, etc., will have experts on staff that can help answer collection emergency questions. Many states also have state-wide preservation groups with experts who can help (e.g. the North Carolina Preservation Consortium, LYRASIS, Texas Library Association). LRYASIS Performing Arts Readiness has experts to help performing arts organizations respond to disasters. September is National Preparedness Month. Even if your institution was not affected by recent storms, now is a good time to review your current disaster plans and training. The Alliance for Response links cultural heritage and emergency response representatives. There may already be a local AFR network near you or you could consider forming one. American Institute for Conservation–the Disaster Response and Recovery website has a lot of useful links. The AIC Wiki — Extensive instructions for planning for and responding to disasters. Northeast Document Conservation Center–Emergency Management Leaflets are organized by type of material for quick reference. University of Texas at Austin iSchool–Great collection of useful links focusing on family treasures, including to how-to’s by format. Western Association for Art Conservation–Salvage at a Glance poster breaks down response by material type. Library of Congress Emergency Response page –Click through for more specific information. 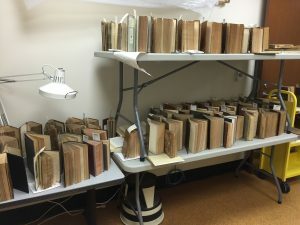 FEMA–The Heritage Emergency National Taskforce and the Smithsonian Institution have written documentation on saving personal treasures in multiple languages. National Archives–If you were impacted by a hurricane and need priority service to ​obtain or replace proof of U.S. military service, you can contact the National Archives National Personnel Records Center. Information can be found on the NANPRC website. FEMA–A good list of what entity you should contact if you need to replace important papers such as birth certificates, green cards, passports, etc., can be found on the FEMA website. 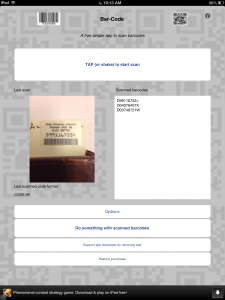 U.S. State Dept.–More information on replacing lost or damaged passports. Both the Society of American Archivists and the Texas Library Association have disaster relief funds available. If you know of other useful resources, please leave them in the comments. 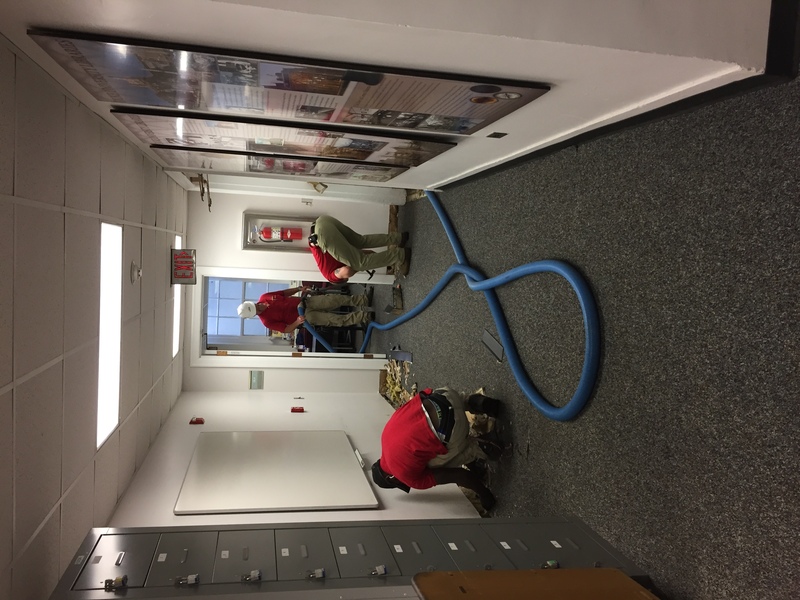 We had some torrential rain in Durham last night and early this morning staff at Lilly Library on East Campus reported water on the floor in the basement level. 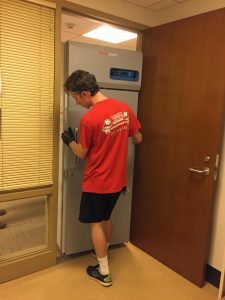 Facilities and Conservation Services quickly sprang into action to assess and respond to the needs of the affected collections. Luckily no books were affected. 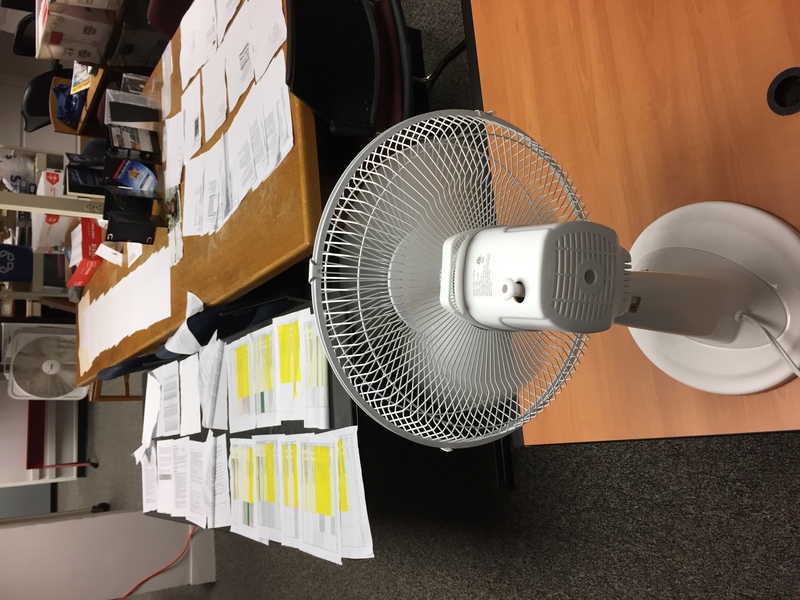 Only some VHS tape cases and paperwork on a desk got wet, so we were able to set them out on tables with box fans and oscillating fans to dry. 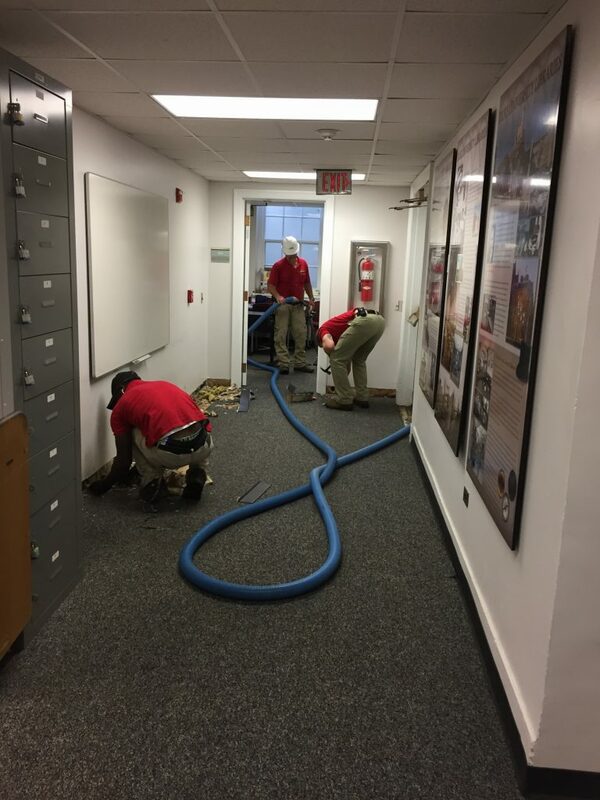 A crew from AfterDisaster also quickly arrived and began removing water from the carpets, opening the bases of walls to allow the sheetrock to dry, and setting up dehumidifiers. 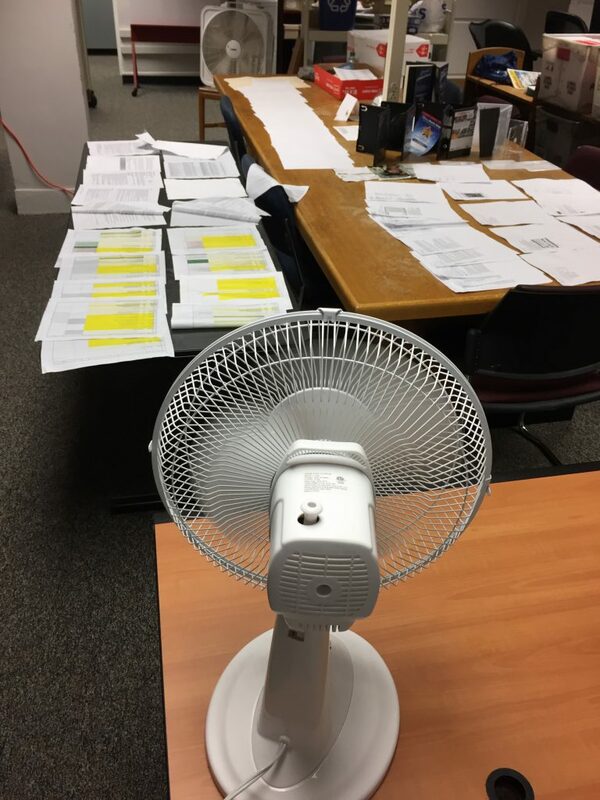 One of the dangers to book and paper collections after flooding is elevated relative humidity (RH) for long periods of time. This can promote mold growth, so their efforts will ensure that the RH returns to normal levels quickly. 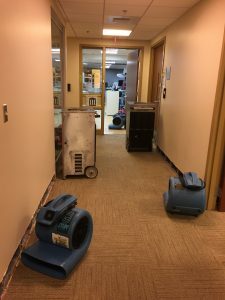 This is the second basement water event we have had in as many months, but in both cases we followed our disaster plan and our collections came through relatively unscathed. It’s great to work with such a great team! We have posted about hurricane awareness and disaster response before. With two major hurricanes hitting the United States so far this season, it is time to round up some information for those hit by these and other storms. 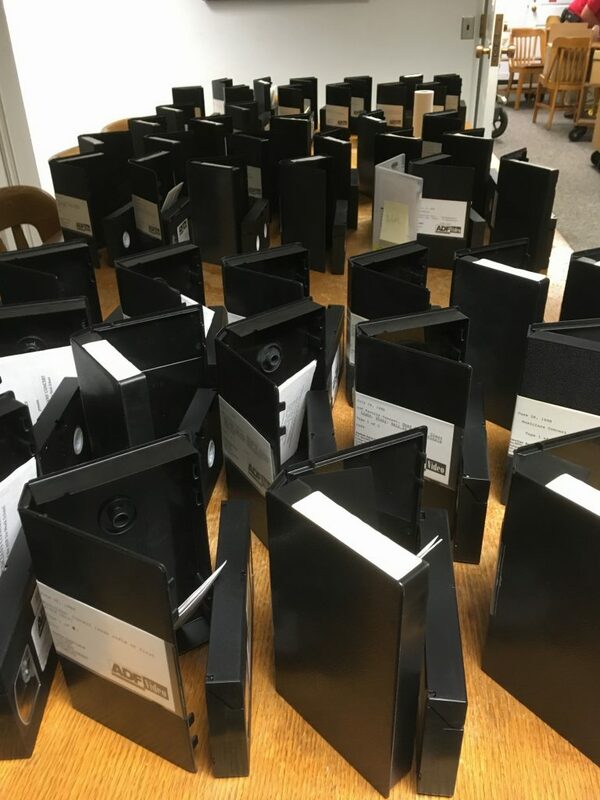 Local and state organizations such as state archives, museums, university libraries, etc., will have experts on staff that can help answer collection emergency questions. Many states also have state-wide preservation groups with experts who can help (e.g. the North Carolina Preservation Consortium, LYRASIS, Texas Library Association). 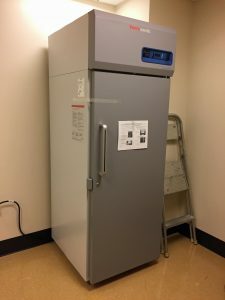 Special Delivery: It’s a Freezer! I don’t know where the birdies are, but we know where our brand new freezer is. 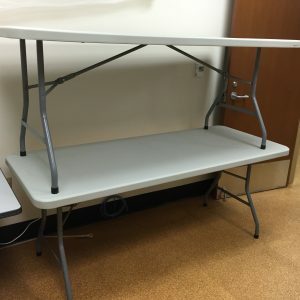 It’s been delivered to the disaster supply room. 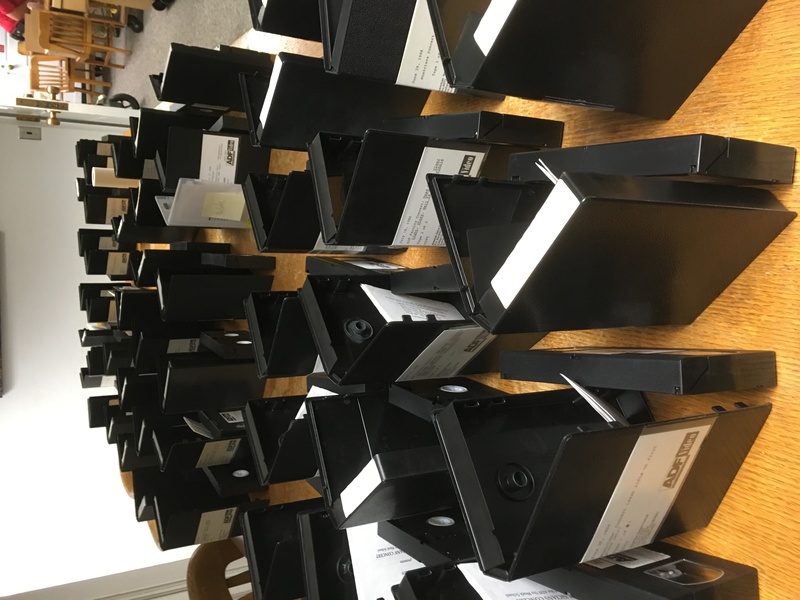 Happy Preservation Week to us! Remember a couple weeks ago when I mused that we might stack two folding tables on top of each other to dry twice the amount of books in the same footprint? I can report that it works really well. We found some additional damp books from the disaster we had a couple weeks ago. Since the tables were still set up I decided to test my hypothesis. It worked really well. As you can see below I made sure there were plenty of fans to circulate the air around the top layer. The books are drying nicely and we can still move around this small space with relative ease. Pro-tip: Use folding tables stacked two-high for drying wet books with a more compact footprint. This morning I stacked two of our folding tables on top of each other to allow the tops to dry before putting them away. It occurred to me we could have created this two-tiered drying table to dry the wet books we got this week. We could dry the same number of books using half the floor space. Alternatively, we can dry twice as many books on the same footprint if we had four tables, in two stacks of two. I need to remember this for next time. I think it would work as long as you were sure there was enough air flow around all the tables. Am I the last person to come up with this? We got a lot of rain in the wee hours of Monday morning. Housekeeping alerted the library, and our Preservation Officer and Head of Security sprang into action. The rain found its way from the roof down three levels to the sub basement. Most of the damage was to ceiling tiles, carpeting and equipment. It could have been worse. Less than 100 collection items got wet. We set up drying stations in the lab and in the fume hood-room and quickly got to work. At one point we ran out of fans and put out a request to our colleagues. Within minutes we had more than enough to get the job done. We had to take only one book to the freezer. Rachel setting up drying stations in the fume-hood room. 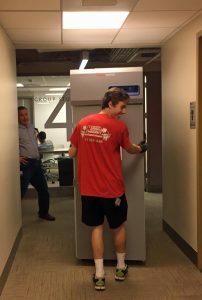 Unfortunately the water found its way inside the walls of the Digital Production Center, Conservation and our disaster supply closet (oh the irony). Our vendor had to pull the baseboards out and cut holes in the wall to allow air to get inside to dry the drywall. We had more rain Tuesday night with additional moisture seeping through the walls. Looks like we will be working undercover for a while until they track down the problem. We’ve had some good practice at this sort of thing, so we know how to be productive even though the lab is a mess. Disaster in the disaster supply closet. Outside our front door, before pulling up the carpet. We are hoping for drier weather in the days to come, but July and August are our rainy seasons so anything can happen. Until then, we will do what we can and stay vigilant for more leaks. *I realize this video has been said to be staged, but it is still pretty accurate to how we felt on Monday morning. I grew up in Dayton, Ohio. You don’t grow up in that city without knowing two things: the Wright Brothers invented the airplane there and thus Dayton was “first in flight” (sorry North Carolina); and the city suffered a devastating flood in March of 1913. The Great Miami River flooded downtown Dayton killing almost 400 people and displacing tens of thousands. You can still see remnants of the high water mark if you look closely at the historic buildings that survived. 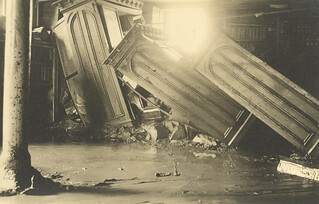 Damage to the main library in Dayton during the 1913 flood. Image from Dayton Metro Library Local History Flickr page. Floods and disasters are never far from a collection conservator’s mind. 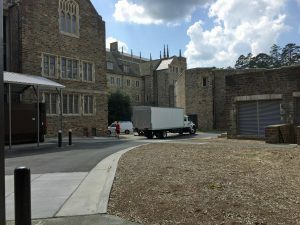 Just a couple weeks ago the entire American Institute for Conservation’s annual conference was on the topic of disasters. 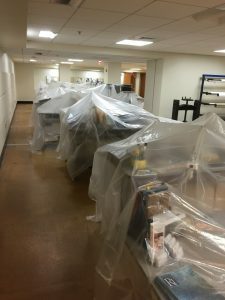 Even our own lab has been flooded during the Rubenstein Library renovation. All this is to say stuff happens, and we always seem to think about it. Which brings me to my very true story. The other night I had a nightmare that seemed to combine just about every worst-case-scenario event that could happen to a conservator. The scene: the conservation lab. I am in my office and I hear a loud noise above my head. All of a sudden out of the ceiling comes a huge circular saw and it is cutting through my office walls sort of like how Bugs Bunny cut Florida off from the United States. “No one told me we were under construction,” I said to myself. At the same time, there is water coming from everywhere as if a live water pipe had been cut. It’s coming up fast and we are scrambling to get things out of the way. While all of this is happening, I am trying to conduct a tour through the lab. I said under my breath, “This is about three times the number of people Development told me would be here,” but I carried on because that is what we do, right? I was trying to ignore what was happening around me and get the thirty or so people on the tour to focus on the amazing projects that my conservators were working on. Needless to say, it didn’t go very well. The last thing I remember is thinking, “How will I represent this on our statistics.” Then I woke up. What does it all mean? Have you had conservation nightmares? This week is Hurricane Preparedness Week. Don’t be fooled, just because your institution is inland doesn’t mean you can’t be affected by hurricanes. The remnants of large storms can move inland for hundreds or thousands of miles causing flooding and spawning tornadoes. Hurricane Fran hit landfall at Bald Head Island on September 5, 1996. It’s 115 mph winds carried inland and dumped 8.8 inches of rain in Durham, the highest recorded rainfall at the time. You can still see the remnants of the damage of Fran in some areas of Durham. The 2016 hurricane prediction forecast is for a very active year. If you didn’t review and update your disaster plan on May Day or during Preservation Week, now is the time. At the very least, update your institutional phone tree and make sure your vendor contacts are updated. If you have more time to devote to preparedness, check out NEDCC’s D-Plan, a free disaster planning site that allows you to customize your plan to your institution. NEDCC also has a good handbook for developing a community based disaster response called Coordinated Statewide Emergency Preparedness (CoStEP). We have written before about useful apps for disaster situations. Downloading these now could help you during an emergency situation. There is also a lot of disaster preparedness and recovery information online. Be a good consumer and start with trusted sources such as the Northeast Document Conservation Center (NEDCC), the North Carolina Preservation Consortium (NCPC), or the American Institute for Conservation (AIC). I am always on the hunt for useful tools. The other day I had a large number of books and I needed to record the bar codes and transfer them into an excel file. I don’t have a laptop at work, but I do have an iPad. 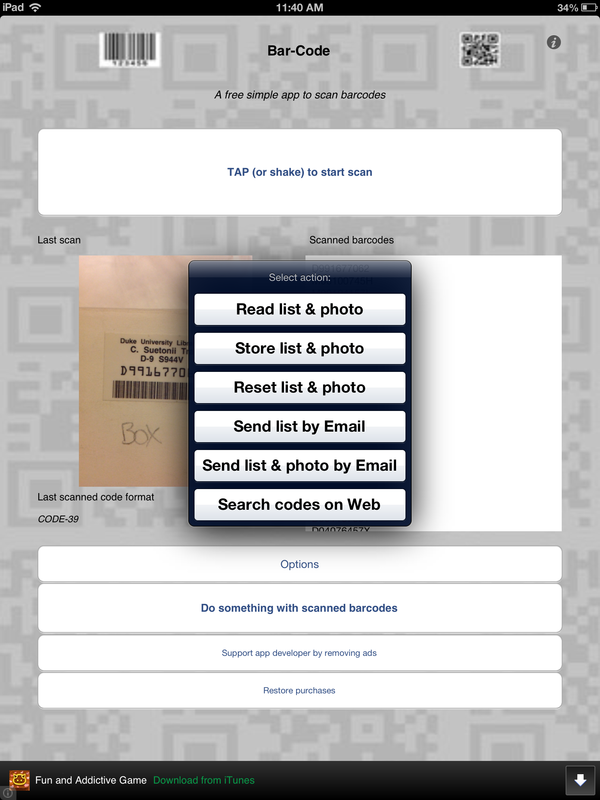 I searched the app store and found “Bar-Code.” It looked like it would do what I needed so I downloaded it. Within a couple of minutes my project was underway. 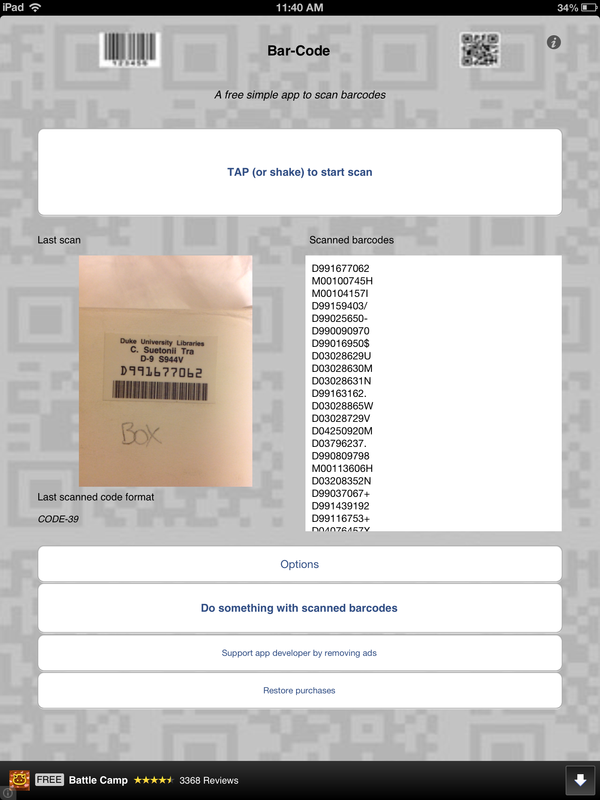 Each bar code is scanned as an image and is transcribed on the right-hand column. When you are done, you have the choice of what to do with the data. I chose to email the list to myself so I could put it easily into an Excel file. 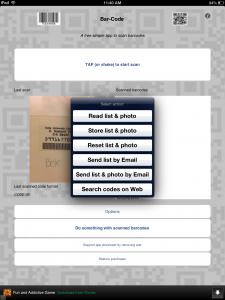 Using this app beat writing down all the bar code numbers and retyping them into a spreadsheet when I got back to my office. It saved a lot of time. The free version, which I used, does not save the data once you email it. I believe the paid version of this particular app will allow you to save your data. I think this app, or a similar one, could be very useful during a disaster situation when you needed to track items going offsite for freezing. You could scan each item going into a crate, then send each crate’s inventory to yourself as an email. I think I would make each crate a separate email in case the network or app crashed unexpectedly. 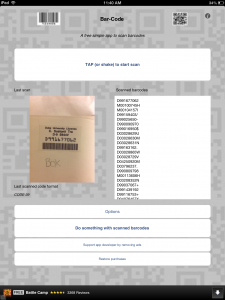 I would hate to record hundreds of bar codes then have the network crash or an email not go through for some reason. 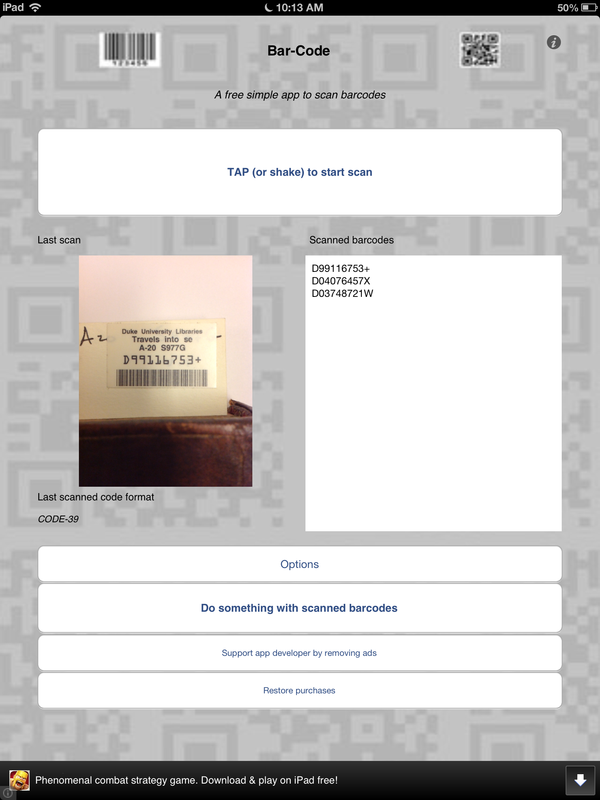 What apps have you found useful in your preservation or conservation duties and how have you used them? Please share ideas in the comments section.